Whether you and your team are just getting started with online proofing or you’re looking to scale up your usage, we've collected some best practices to help you get the most out of your review and approval process. It's not just creative content that can benefit from a cloud-based review and approval process. Customer-facing content - designs, web pages, ads, videos, etc. - should always be collaboratively reviewed, but you should also consider using the same review and approval processes for traditional content types, like Microsoft Office documents. Each of these applications has fine native commenting capabilities, however, teams can run into challenges if team members are using different versions of the software. By reviewing these docs in the cloud with an online proofing system, the proof viewer acts as an abstraction layer, removing the dependencies of software versions or other viewing requirements. Pro-tip: Ensure that the file types you do choose to review via online proofing are not encrypted or password protected. In most cases, your online proofing system can protect the document at the proof level, to ensure the security and fidelity of your content. One of the most tangible benefits of online proofing systems is the collaborative aspect of the review and approval process. By creating review groups and stages, you're not only leveraging your team members' knowledge and expertise, you also able to keep key stakeholders updated (more on that later) and on the same page as the project progresses. Include an expert. Beyond the immediate team responsible for the production of the creative, are there experts (either internal or external) that would be suitable to invite into the process to provide feedback? Purpose-built review groups. One of our customers starts the review process at wireframe stage and has a review group assigned specifically for brainstorming. 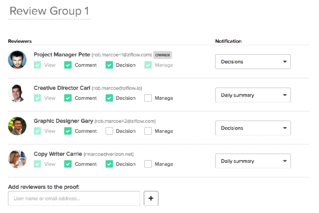 You can also create review groups to serve as focus groups ahead of final production. If you or your clients have compliance (brand or regulatory) requirements, you can also create a compliance review group. Whatever the specialty, you can choose to utilize review groups to keep feedback focused and effective. Narrow the review funnel. One best practice for larger teams is narrowing the review group, in terms of size, as the project progresses and versions near final approval. This allows team members to peel off and focus on other work items. Is there someone in the review group that is knowledgeable specific to the creative content being reviewed? This expertise can be related to the type of marketing channel which will ultimately be leveraged for the content, or it could be related to the type of audience which will be targeted. Don't forget, "expertise" could simply mean experience with the brand itself, a knowledge of the brand's values and history Sometimes, common sense can be the best feedback, helping to avoid off-brand mistakes that can happen. Identify decision-maker(s). Always identify a team member who will make the decision to move forward; either by requesting a new version with changes or for outright approval. To not do so could leave a piece of content in an endless review cycle. Deadlines are a good thing! It’s always a good practice to set a deadline for feedback. If your review team is larger than 5-6 team members, a deadline should be a requirement to keep the project moving. Pro-tip: If you require compliance sign off for your proof, assign a specific person to the decision-making role, which will help audit-trail requirements if needed in the future. Taking creative content out of email for review is a tremendous efficiency gain for marketing teams, but marketing teams are still busy. When possible, leverage the integrated notifications available in your online proofing system, both as reminders of deadlines, but also to surface new comments to all team members for better collaboration. Remember, not all reviewers will see the comments being made in real time, so notifications become very handy. Notifications provide another benefit by keeping those team members who aren’t necessarily providing comments and feedback, but are wanting to keep up with the progress of the project, are able to easily via the notifications. Pro-tip: If your online proofing system supports varying notification settings by roles, set the designer on the project to receive all comments as they are made, and choose hourly or daily updates for the rest of the team. If the designer finds themselves with some free time between projects, they can take action on feedback as it is made. Effective feedback is the best type of feedback. So, encourage team members to make full use of the annotation and markup tools in your online proofing system. In many systems, the markup tools can be combined, providing even more detailed feedback. We've mentioned the concept of collaboration a few times earlier in this post, and this certainly applies to comments in the review and approval process. If your online proofing system supports it, be sure to utilize the threaded comments and replies capabilities. Threaded comments allow for discussions to occur, driving further clarity around change requests with rationale and examples. This can be even more impactful if your application supports attachments in comments. Pro-tip: Have a creative brief (or similar requirements doc) for your project? Create a comment with a link to it, or attach the doc itself, in a comment, keeping it handy throughout the process. A best practice when it comes to creating new versions driven by previous comments and change requests is to add that new version to the existing/original proof project, not to create a new project for it. By adding the new version to the same project, it also allows new review team members to quickly come up to speed on earlier work and see the feedback that got the proof to the current state. It's a rather interesting approach. It keeps the entire creative process together and can serve as background for future projects as well. These are just a handful of online proofing best practices and tips that we've gleaned from our clients and customer success team. We hope you can learn from them to make your online proofing experience more efficient and rewarding. For more tips and tricks and general industry thought leadership, subscribe to our blog today.